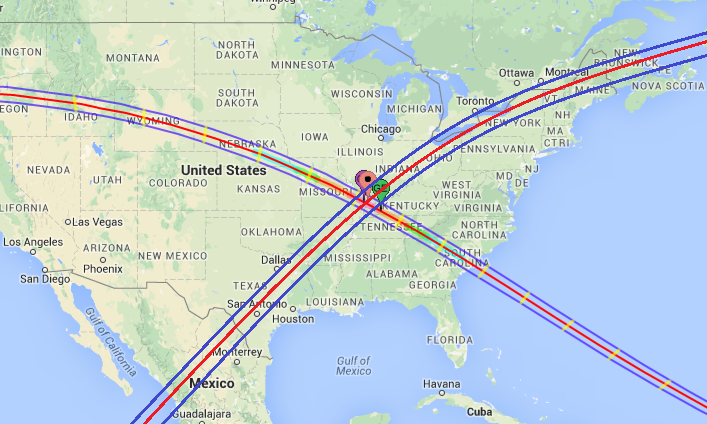 The link below is to an image of the paths of the total Solar eclipses of 2017 and 2024. The X happens to mark a spot a few miles from the epicenter of the largest known earthquake ever in the US, the New Madrid quake of 1812. We're told that a large quake, 8 to 9 0n the Richter scale, has happened about every 200 years in this area according to geological evidence. Will the combined gravitational pull of the earth and sun lined up in a total solar eclipse on August 21, 2017 be enough to trigger the next one? Incidentally, we live about the same distance from the center of the X as the epicenter of the New Madrid Missouri quake of 1812, well within the paths of both solar eclipses! We have a front row seat to view the 2 minute and 40 second maximum eclipse on August 21, and we're only a few miles from the New Madrid fault. Would you be excited, or scared? Hi Ed, Awe is a good description. I can't get any more excited waiting for your book, and fear is not justified anymore. A deep sigh and a high sign. Have fun with it, you earned it. Thanks, Patrick. I'm Working on the book today! Maybe I'll have it finished before August 21. I'll be submitting to publishers, but will self publish if necessary. Peace Ed, I'm sure you have no reason to rush as I believe time is on your side. It would appear illogical for our creator to not halt your progress now!! Maybe complete it under the shadow of a new dawn! Enjoy a work well done friend. PS Did you ever meet my sister Shirley L working at Virginia during the early days of computers in the 60's? She escaped to Alaska. Small world! !